Socialing kittens while they are young is very important. Read this wonderful article from a breeders point of view on the benefits of early socialisation. Finding helpful and reliable information about kitten socialisation proved more difficult than I envisaged. Checking on the internet bought up some really bad information. For example, the Purina site suggests you take your kitten out on to the park to socialise. The PDSA tell us that the critical period of socialisation is between eight and ten weeks. Although there has been little research with kittens there has been plenty of excellent research with puppies, and most animals do develop at the same age, and the importance of early socialisation with our pets is imperative. The critical time for socialisation is between two and seven weeks. I became aware of this in the early sixties when the Guide Dogs for the Blind opened a new breeding centre and puppy walking scheme. Before this puppies were bought in from various breeders and older dogs were taken in for training, but the pass rate was abysmal, costing a lot of money to produce one good dog. However, with the selection of good temperament and early socialisation with puppy walkers the pass rate moved up to almost one hundred per cent. Breeding Siamese in the seventies and Labradors in the eighties I used this knowledge to proof the kittens and puppies against everything I thought they may come into contact with in their new pet homes. 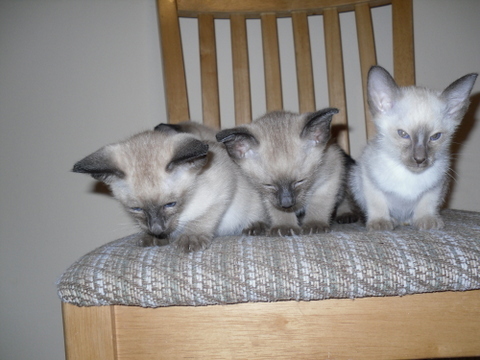 Now back to breeding Siamese I am even more aware of this crucial period. Research shows that information going into the brain between two and seven weeks opens up pathways, I call these information highways. Research examining the brains of dogs that are house pets who have had early learning and those reared in kennels that have not received the vital input, shows that the kennel dogs had far less information highways than the house dogs. This research has proved valid in pets and people. Many breeders I know have their kittens in a place where they will be well socialised but there are still some who believe that they should be kept in a quiet room with no visitors. The kittens bred outside in a cattery situation are also likely to lose out in the early learning period. My kittens start off in a bedroom because it is convenient but they are exposed from the moment they are born to many different sounds, sights and smells. Bearing in mind recent research that appears to prove babies in the womb can hear music and that brain development can benefit from certain types of classical music. Mozart being one of the most popular. Jasmine (our queen) was exposed to Mozart on a daily basis before the birth. From birth the kittens were exposed to many different sounds; classical music through to Meat Loaf. Plus a sound effects CD with just about every sound effect you can imagine from plains to thunderstorms, from pigs to people screaming. Although we are largely unaware of the kittens ability to hear at birth, it could be difficult to assess due to the way the brain develops, so a hearing ability could be present but the ability of the brain to react does not appear for a couple of weeks. There are some sensible articles; Gwen Bailey is a very good canine and feline behaviourist who has written a good book for new kitten owners. I feel it is very important to start my kittens in a pen, especially good training if you are going to show, but teaching any young animal that there are boundaries is good training. While the kittens are still immobile and in their pen I get lots of people to come and sit in the room bringing babies and toddlers, I try to keep this up until kittens leave for their new home, exposing them to different scents, sounds and voices. Luckily we have lots of friends who do not own cats so no worries about exposing kittens to any disease’s that could be carried from other cats. As soon as the kittens become mobile they are handled by as many visitors as possible. At this point we do have cat owners but if you are worried about anything passing on ask visitors to disinfect their hands. Young kittens should be handled by as many people as possible. Because my kittens are based in a bedroom, they are exposed as soon as they are mobile to all other areas of the house, kitchens hold lots of noise and activity, such as washing machines, dogs barking and people coming in and out. Their bedroom must look very odd to visitors as it has all types of things in that the kittens need to see and hear, I put vacuum cleaners on every day, have toy dogs that bark and walk lots of different musical instruments. Handling daily is so important; we cut nails regularly, clean ears, wipe eyes, brush and get them used to having their tails and mouths touched. Try to think of everything your kitten may come across in their new home and expose them to this early in their life. Eight weeks is too late. Jasmine had eight kittens for her first litter, a lot to cope with, and visitors were amazed to see them all racing around, and asked how on earth I could keep an eye on all of them. Hard work but it paid off, every kitten owner told me that their kitten was so friendly and outgoing. What is my Cat Thinking? : The essential guide to understanding your pet By Gwen Bailey. Published by Hamlyn. 2002.